This is a pendant based on the style of a medieval/renaissance painting with a touch of the design from the UK's welsh unicorn. I try to be a little different from everyone else's style, and it seems to work for me! Made in antique bronze, 90% copper and 10% tin, it's 2 inches long and 1 1/4 inch wide with a bail that can pass a 1/4 inch chain through it. It's very solid, and perfect for someone who wants to have a piece that stands out! Bronze is an alloy that consists of a mixture of approximately 90% copper and 10% tin. 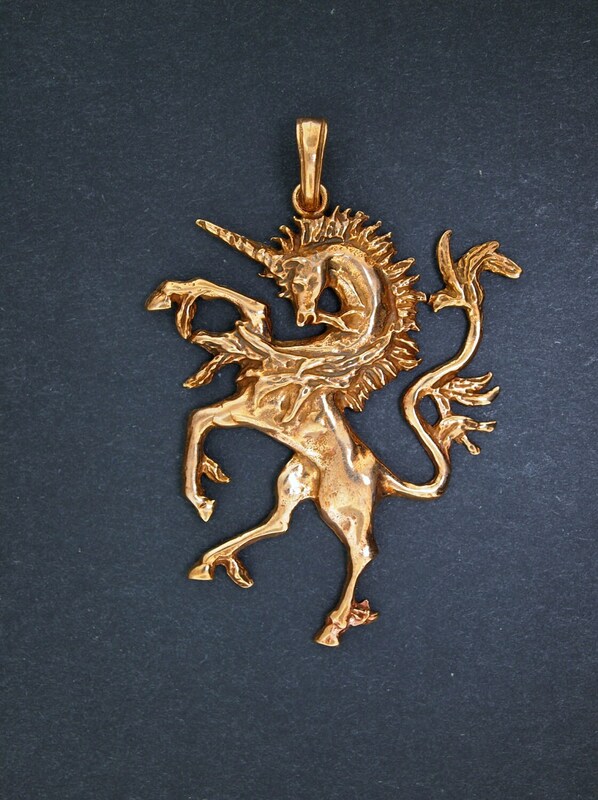 Producing bronze is a less toxic process than producing brass as brass is a combination of copper and zinc, and the manufacturing process often produces zinc oxide which is toxic. Because bronze contains copper, it can turn your skin green whether you have an allergy or not. Bronze and copper turn your skin green because when the copper reacts with your sweat and the acids from your skin, it produces copper chloride. Copper chloride is a green substance that then rubs off on your skin. If you are prone to sweating, your bronze jewelry will definitely turn your skin green. This chemical reaction can also be prevented by painting any part of the jewelry that comes in contact with your skin with clear nail polish. Item as described. Well-crafted and beautiful in design. very beautiful pendant, thank you! gorgeous! so detailed and elegant.